This year’s Labor Relations Special Session was especially timely with its panel discussion on The Impact of the Affordable Care Act (ACA) on NECA Contractors. Geary Higgins, NECA Vice President, Labor Relations, and Trustee of the NECA/IBEW Family Medical Care Plan, moderated the panel which included Tiffany Downs, Attorney at Law, FordHarrison LLP, and Travis Smith, President, Foster & Foster Actuaries. “Bigger plans are going to be better very soon,” Smith commented, when asked about how the ACA with affect the Family Medical Care Plan. Smith outlined several compliance issues for local multiemployer health and welfare plans. Downs addressed the moving-target of ACA reporting requirements. “One reason the Obama Administration delayed the plan for a year for businesses is that they couldn’t get the requirements to line up. However, multiemployer plans aren’t necessarily a part of that extension.” Downs gave a checklist that NECA contractors and local plan trustees can review to assess their burden and responsibilities. 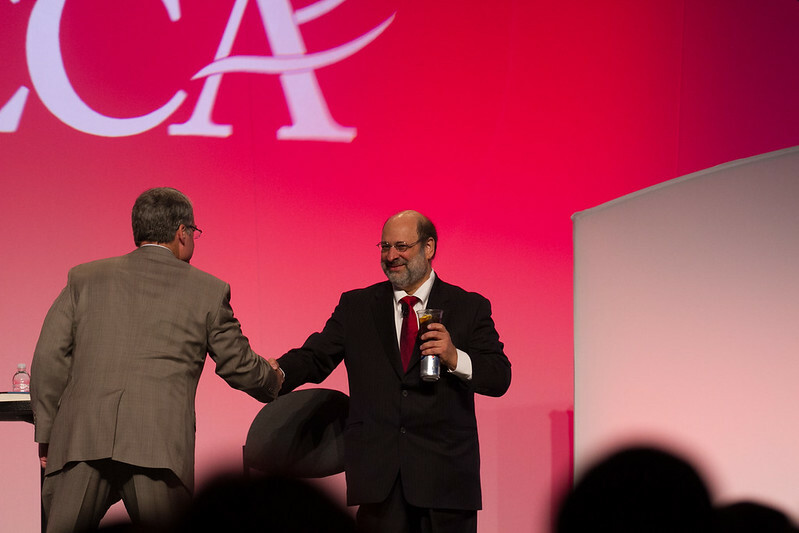 Negotiator-extraordinaire Stuart Diamond impressed attendees at this year’s Labor Relations Conference so much that NECA has invited him to lead the special Labor Relations Generation Session in Las Vegas. You’ll actually have two chances to hear Diamond on Monday, Oct. 1: his management workshop/consulting session, Getting More Every Day, from 8-9:50 a.m., and the General Session, starting at 10 a.m. Diamond will focus on the problems and prospects of emerging markets and international business challenges in an environment of change from his latest bestseller, Getting More. Diamond’s Getting More presentation discusses how the business world is notoriously perceived as combative, dominated by an aggressive conflict model of negotiation. However, Diamond shows how moving from this combative model provides a massive advantage. Counter-intuitive to its core, his process focuses on finding and valuing the other party’s emotions and perceptions to create far more value. In this presentation, you’ll learn how to ask questions of the other party, glean the “pictures in their heads” and ultimately, persuade them. Armed with new persuasive power, you and your business will be more competitive than ever before. Diamond is a Pulitzer Prize-winning journalist, author, Wharton Business School professor and president of the Global Strategy Group. In addition to advising corporate and government leaders in more than 40 countries on negotiation and cultural diversity, Diamond’s negotiation course at Wharton is consistently ranked as one of the school’s most popular. He has taught negotiation at Harvard Law School, from which he holds a law degree and is a former Associate Director of the Harvard Negotiation Project. As president of Global Strategy Group, Diamond advises companies and governments on negotiating foreign investment and devising strategies, structures and marketing to compete effectively on an international scale – essentially the skills of planning and persuasion – for some of the world’s leading companies. Diamond will sign copies of his latest book on negotiation, the New York Times bestseller Getting More, following the General Session. Today’s Labor Relations General Session was a departure from the traditional panel discussion. Rather, the session focused on the important, if somewhat hard to hear, news about multiemployer pension plans. Randy DeFrehn, Executive Director of the National Coordinating Committee for Multiemployer Plans, kicked off the session with a run-down of the legislative action NCCMP has pursued to protect local pension plans in the face of the economic downturn, including a freeze on plans’ “Zone” status, options for small plans to merge, “partitioning,” and some technical corrections. NEBF Executive Secretary/Treasurer Larry Bradley make a great report on the fiscal health of NEBF. “NEBF’s actuaries have certified our plan in the Green Zone since the law was passed in 2006, and I’m proud to report that even through the recession, we have remained in the Green Zone. Our actuaries remain optimistic of the future health of the plan. “What’s important to us are the people behind the plan – the lives we touch and the very real ways we can help them,” Bradley concluded. He also mentioned that NEBF’s website will soon have sample disclosure forms for contractors to use to meet the revised FASB reporting requirements for pension plan withdrawal liability, now based solely on publicly available plan information. There are many changes coming this year for labor relations. The IBEW has embarked on a nationwide campaign to recover the work that the unionized electrical construction industry is currently not doing. 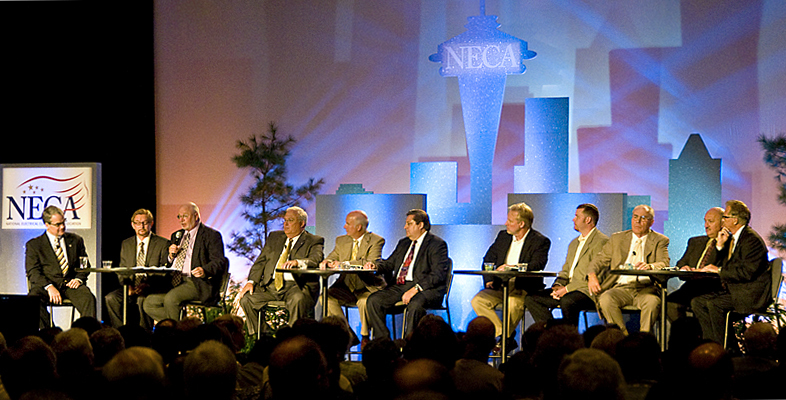 Monday’s general session program at NECA 2010 Boston is about illuminating those changes to make you, the NECA/IBEW contractor, more competitive in today’s marketplace. The program will open with a roundtable discussion including NECA President Rex Ferry, NECA CEO John M. Grau and IBEW President Ed Hill on the competitive issues and changes that are taking place in our industry. The discussion will be followed by a presentation featuring four NECA members from around the country who have successfully put these new “market recovery” programs to work. Don’t miss it!